Click on the above link to let us know what you think (or send email to emeriti@emory.edu)! Your financial support is greatly appreciated and needed. Find other members to get together for shared interests. Send email to the following link to contact members who would like the same activity! 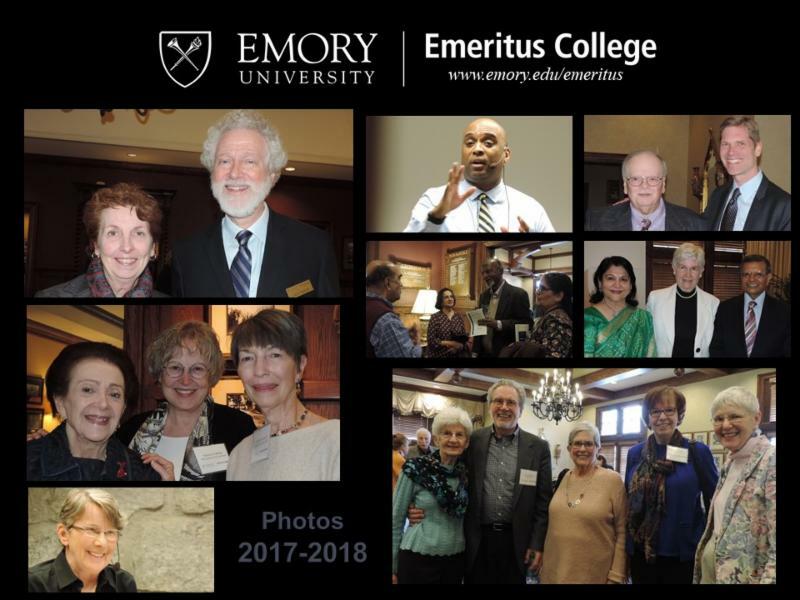 This issue of our newsletter is sent to members and friends of the Emory University Emeritus College (EUEC). I hope the newsletter will help keep you informed about our activities and help you feel connected with our members throughout the U.S. On the left are links to our website and links to contact either me or the EUEC office. With this issue, we close a major chapter in the life of the Emeritus College. 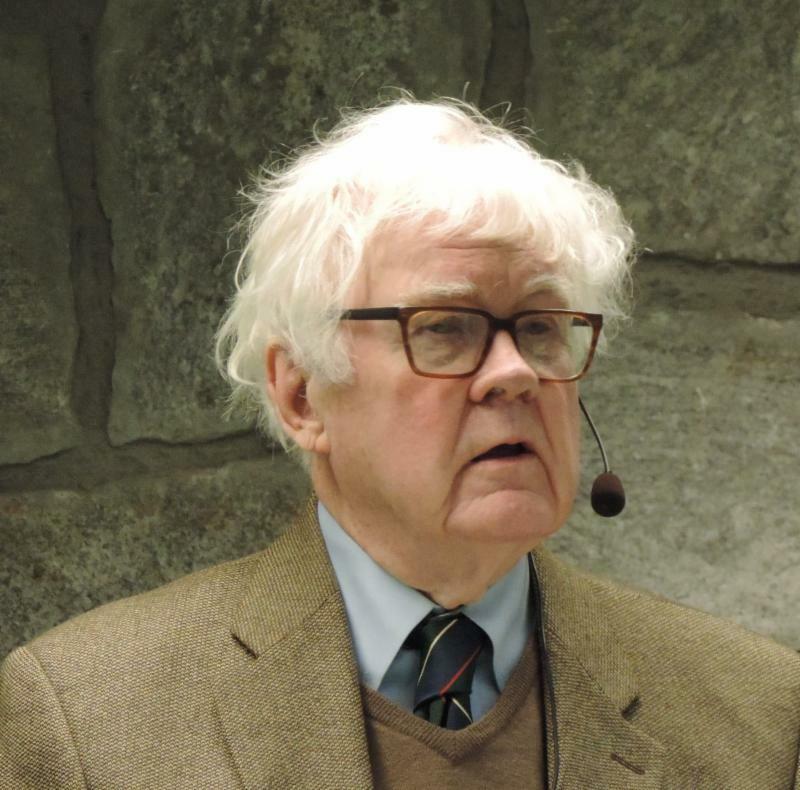 There was a memorial service for our co-founder, John Bugge, on December 8 and below you will find a short synopsis of the service, the program for the service, and the text of remarks made about John in the service. John played such an important role in the life of the Emeritus College in so many ways. There is no way he can be replaced, but his legacy will continue and certainly the best way to honor his contributions is to continue to develop the Emeritus College. As John said, "there should be no retirement from the life of the mind!" If any of you would like to make a gift to the Emeritus College in John's honor, there is information below about how to do that and how the funds will be used. We closed the year with two great programs and thanks to Vernon Robbins and Marianne Skeen you can read about them below if you were unable to attend. Bonna Wescoat's work on Samothrace is fascinating and also demonstrates the power of true interdisciplinary work. I never would have imagined being able to take virtual walks through digitally reconstructed ancient places and what discoveries could be made from such reconstructions. In an entirely different vein, many of us have probably seen one of Jim Flannery's Southern Celtic Christmas productions live at Emory or have seen the PBS broadcast of the specially produced live version. Even so, it was a special experience to hear Jim talk about how the PBS version was produced, find out behind-the-scenes information on some of those who participated, and hear Jim read and sing. His talk made many of us want to purchase the DVD and see not only the broadcast version but see the DVD extras! Thank you Bonna and Jim for helping us end the semester so successfully! I wish you all greetings for the holidays and look forward to seeing many of you around when we being our next semester in January! I am very grateful to Gretchen Schulz and Ann Hartle for help with editing and proofing. 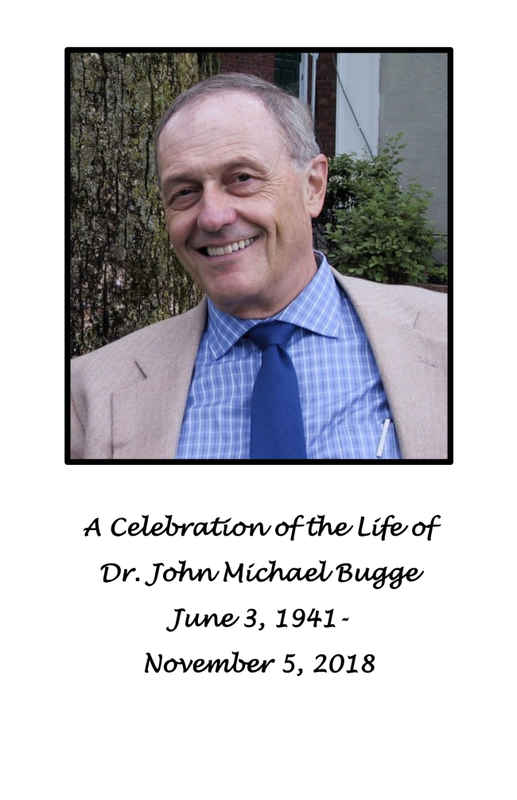 We continue to celebrate the life of John Bugge, one of the co-founders of the Emeritus College and Chair of our Executive Committee. There is information below about his memorial service on December 8 and the text of reflections about John's life offered by the speakers at the service. 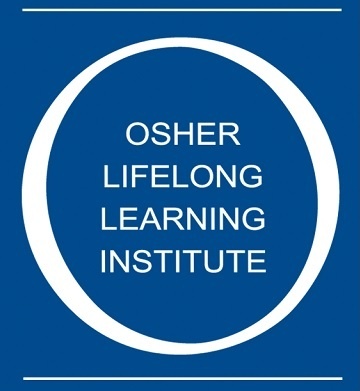 Registration for OLLI winter courses is now open. The winter term is January 7 - February 22. You can get more information about OLLI and register for courses at olli.emory.edu. You can see the complete catalog of courses by clicking here. 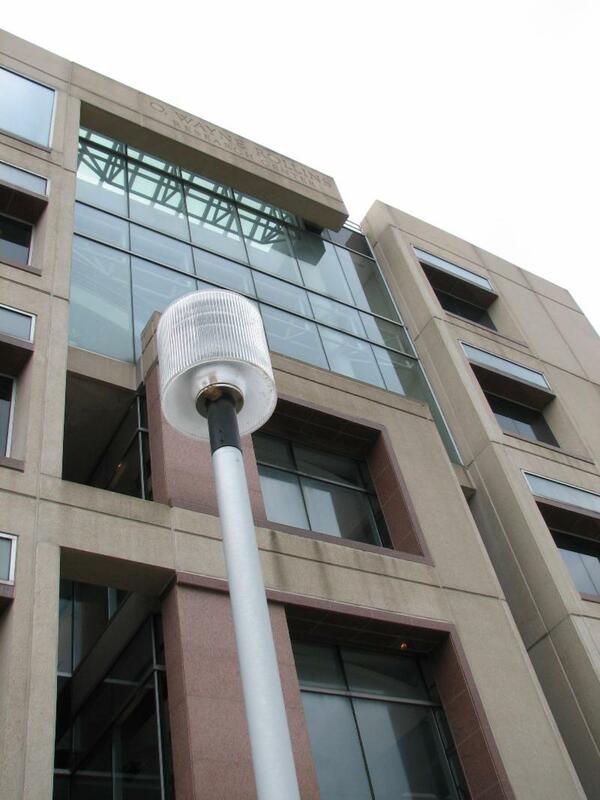 The OLLI courses are given at the Emory Continuing Education location in Executive Park, with convenient free parking. OLLI is in great need of additional teachers, and our membership comprises one of the most talented and experienced pools of candidates. If you would like more information about teaching at OLLI, please contact Dorothy Fletcher, a member of our Teaching and Mentoring Committee. As a way of encouraging such participation, EUEC offers fellowships to members who design and teach a new OLLI course. Information on EUEC-OLLI Fellowships can be found by clicking here. Click here to find the answer to the last Newsletter's picture(s) and to see if you can identify the photo(s) Dianne has taken for this issue. Even to some of us who have known Professor Bonna Wescoat for many years and seen many aspects of her work, this presentation about years of excavation and research to visualize the Sanctuary of the Great Gods on the Greek island of Samothrace in the northern part of the Aegean Sea midway between ancient Troy and Macedonia, the homeland of Alexander the Great and his father Philip II, came as a real surprise. We might have seen some of her work with the Parthenon and scenes from Homer and the playwrights on Corinthian vase painting. But Samothrace? This was something like a best-kept secret from some of us! Where have we been? Just goes to show what we may not know about a colleague we think we know quite a bit about! Some of us know Samothrace as the island on which Poseidon, the god of the sea, sat to watch the Trojan War. And some of us, perhaps many of us in the room, have seen Winged Nike, the famous statue of Victory now at the Louvre Museum in Paris. And some of us even may have remembered that Winged Nike was from the Greek island of Samothrace. In fact, many years ago now when my wife and I saw Winged Nike in the Louvre, some people from Greece were shouting out that it should be returned to Greece from where it came! I know that Samothrace is often mentioned as a place where one of the ancient Mediterranean mystery religions was practiced, but I have never known anything in detail about the place or practice. Of course, Professor Wescoat wasn't able to tell us any detailed information about the actual mystery rites because they were secret and have remained secret to this day! But she was able to tell us the Great Gods of the Underworld (the Chthonic deities) at Samothrace were focused on travelers on the sea, offering them safe travel or at least safe haven during threatening storm and wind when they were initiated into the rites that were performed there. She also reminded us that the Cabeiri (Kabeiroi) were twin gods who presided over the mysteries held in honor of three great goddesses, Demeter, Persephone, and Hekate. But what she showed us was the amazing story of discovery and creative exploration and interpretation that brings us to the present day when Professor Wescoat and her colleagues and students have envisioned and displayed in overviews, close-ups, reconstructions, and animated visualizations the many buildings and the amphitheatre in the valley below Mount Fengari (Mt. Moon) on the island, which reaches a mile high above sea level. A major problem, she explained to us, was access. How did the people get into the buildings, because the buildings were not located where people could easily get to them and walk into them! Were there bridges? Evidently so, but where were they, how were they built, and why is there not clear evidence of where they were, if they were there? One of the reasons for lack of much of the evidence, it appears, is severe gully washers that have occurred from time to time, pushing evidence down toward the sea, uncovering new things for a time but then burying them under tons of stone and gravel a few years later. It was a special treat to see a video of an archeologist and an Emory student on the site hoisting up a big metal cross with sheets on both sides like the wings of Nike to enable people to experience the visibility she would have had at the place we now know she was located. We watched as the wind blew against the wing-sheets as the two held the construct up, making it difficult for them to keep it up there for very long. All in all, it was a wonderful treat to see all the magnificently arranged and organized photos in Professor Wescoat's PowerPoint. And a series of questions after her presentation kept bringing forth this comment from Professor Wescoat: "Oh, that's a perfect question!" And then she would give us even more fascinating information about the island, the people who visited it, and the people who lived on it on the other side of the mountain. Thank you, Professor Wescoat. This Lunch Colloquium presentation was a real treat. Platters of decadent holiday cookies and brownies and tables with bright green covers sprinkled with red and white peppermints set the stage for a festive holiday presentation by Dr. Jim Flannery. After many years of live performances of A Southern Celtic Christmas Concert on the Emory campus, the production was adapted to film for broadcast on PBS stations all over the country. Dr. Flannery showed eight video clips of major elements of the program and described some of the challenges of transforming the theater production to a film production. He also provided background and context for both the elements of the production and the very talented performers. I think all of us who have the opportunity to view the next broadcast of the program will see it with new insights and appreciation. The concert explores the myriad connections between Irish, Scottish, and Southern Appalachian folk music and culture. It has been characterized as a "rollicking yet reverent" occasion. A key theme underlying the entire production is the manifestation of God in nature and how God is revealed to people in the landscapes of their homelands. And so a key element of the film production was to provide some authentic images of the landscapes that inspired the poetry and music that weave through the production. Iconic scenes were filmed in both Ireland and the southern Appalachians to be interspersed with footage of performers filmed on a stage. Scenes from rural Irish stone churches and graveyards provided context for a reading of the 7th century prayer poem "Quis es Deus" that questions the nature of the God that St. Patrick is bringing to Ireland and where this God might be found. Ruins of a 6th century Irish monastic community similarly add depth to the recitation by Dr. Flannery of the Seamus Heaney poem "St. Kevin and the Blackbird" in which St. Kevin, kneeling in his cell, holds a bird in his hand until its young are hatched. Dr. Flannery also talked about the importance of folk stories to the music. The stories reflect a sense of community and help to bind communities together. The musicians take the stories and add the music, continually improvising both lyrics and music and thereby infusing some of their own personalities into the performance. This is a key element in folk culture and music. The cast can play off of each other and come up with new material. Improvisation and multiple contributions are crucial to folk arts, creating a shared understanding. A CD of the production can be ordered from Amazon by clicking on this link or directly from Compass Records by clicking on this link. The program will be broadcast again this year on GPB on Sunday, December 23, at 8:00 pm. NOTE: As Marianne notes in her article, for those of us in Georgia, GPB will carry the program for the eighth year in a row on Sunday, December 23rd at 8:00 p.m. In other parts of the country, you can check your local PBS station to see when the program will be broadcast. 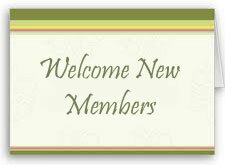 New members are the lifeblood of any organization. Please make a special effort to welcome them to EUEC! Plenary 1-hour lecture at the Atlanta Lecture Series in Graph Theory and Combinatorics, Georgia State University, Nov. 4, 2018, "A Look at Saturated Graphs." 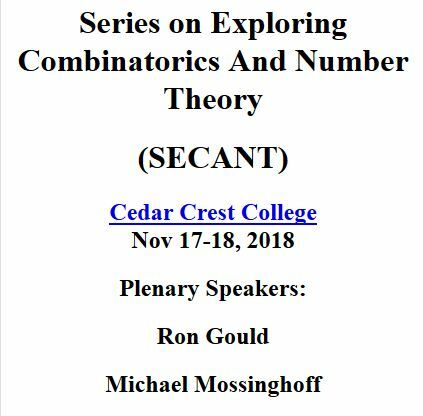 Featured 1-hour lecture at the Secant Conference, Cedar Crest College, Allentown, PA, Nov. 17, 2018, "A Look at Saturated Graphs." The space was filled with the music of Schubert as we entered, with Don Saliers + violin + cello-beautiful! At the reception the ensemble played again as we ate, conversed with others, and greeted Liza. A number of speakers shared memories, each short and appropriate. They reminded us of John's good characteristics (are there others)? Gray Crouse talked about the Emeritus College and John's national work with academic retirees; Mel Konner spoke about John's collegiality and the time John was in intensive care when he visited, and about Liza's and John's relationship; Jim Flannery talked about theater and the Everyman production John was in in the mid-80s. He sang a beautiful Irish/Scots song a capella, words by Thomas Moore. 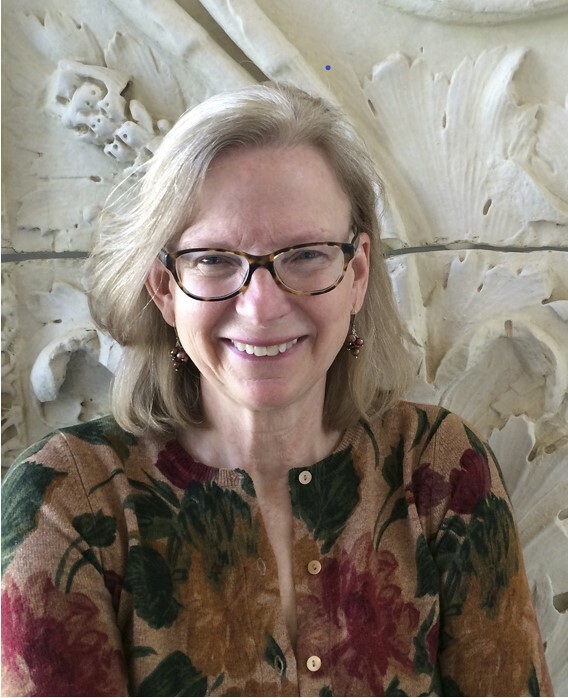 Brenda Bynum focused on how she and John had collaborated on many theatrical/reading performances and how they were in the midst of planning more, and Pat Miller spoke about theater and travel experiences she, Sean (her husband), Liza, and John had enjoyed. Ron Schuchard spoke about collegiality, John's teaching, and John's voice for poetry, and he recited a Richard Wilbur poem that Liza and John loved, loved, "Love Calls Us to the Things of This World." [Both the song and the poem were printed in the program you may access through the link provided above.]. Eric Bugge Emmons made emotional closing remarks about how he loved to hear his dad speak in public and also speak with his family. The text of the reflections may be read by clicking here. There have already been several gifts made to the Emeritus College in John's memory, and we discussed in a recent Executive Committee meeting how best to honor John with those gifts. We know that John was a great supporter of the campaign that established the Bianchi Excellence Fund that supports Bianchi Excellence Awards. In fact, he asked that several recent contributions to the Emeritus College made in his honor be added to that fund. With Gene Bianchi's enthusiastic agreement, we have decided that any memorial gifts for John will be added to the Bianchi Excellence Fund and that subsequent awards will be Bianchi-Bugge Excellence Awards. This will be a very appropriate way of honoring both of our co-founders in perpetuity while emphasizing the central role of the Emeritus College in supporting the continuing life of the mind. 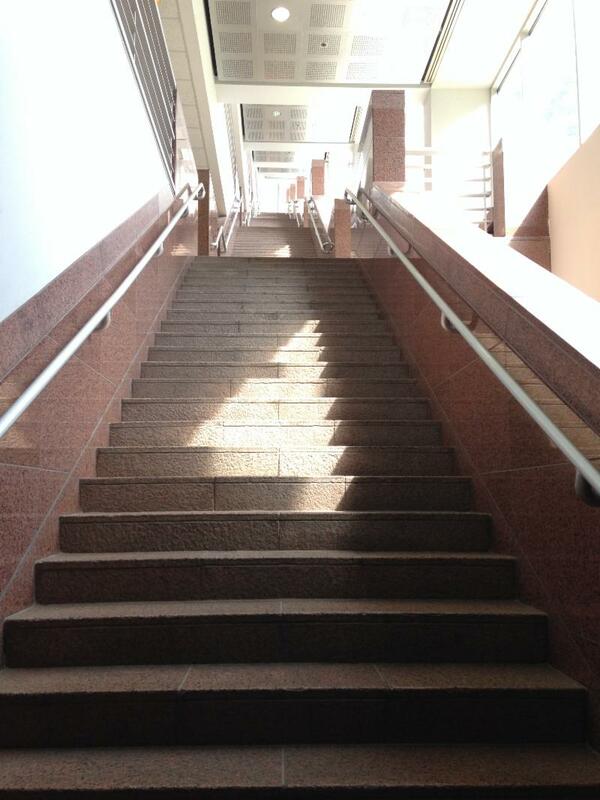 The seemingly endless stairs from our last walk can be found in the O. Wayne Rollins Research Center. In my opinion, the building itself is rather plain with the most notable part of the building being the staircase. Those steps span only six floors, yet, it looks like a lot more. I think what makes it so impressive is that you can actually see from bottom to top. Gray is quite familiar with the stairs and building -- his biology office is located there. The photo in the middle below is of a section of the exterior of the building -- as you can see, nothing out of the ordinary. The building was constructed in 1990 and was dedicated in a ceremony at which three honorary degrees were awarded to distinguished scientists. O. Wayne Rollins, was a Board of Trustees member and philanthropist who helped to fund its construction. A fun note: A few years ago my daughter left her mark within this building. The open lounge area on the 2nd floor, as you exit the elevators, is home to some of her artistic creativity. 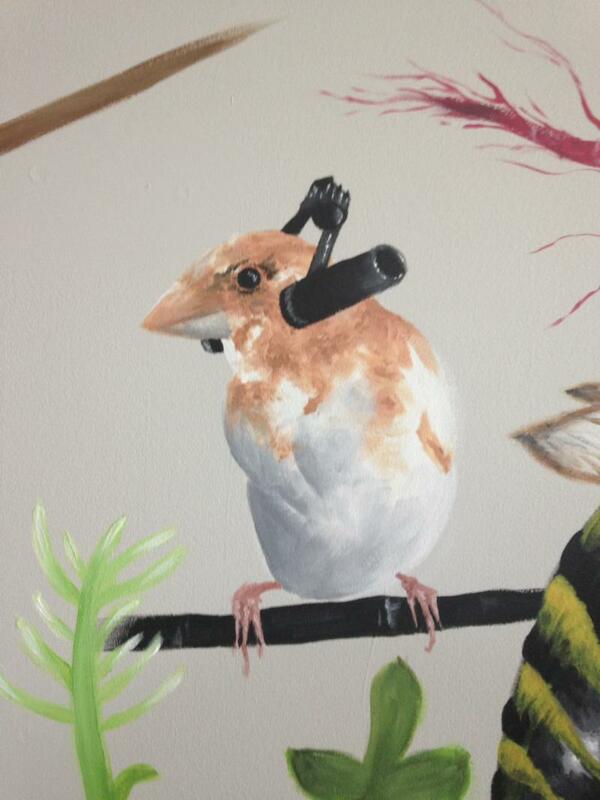 She painted a mural on the walls showcasing some of the research of the biology professors and their groups. The photo below on the right is one little view of what she painted. 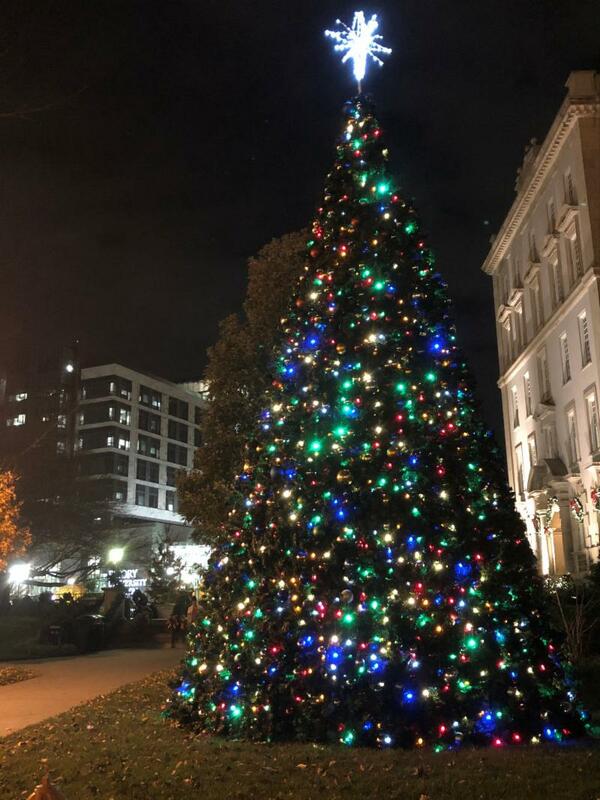 Since we are at the end of the year, I'm going to leave you with a photo---no guessing involved---just one to show Emory University in the holiday spirit. Happy and Safe Holidays to Everyone! !